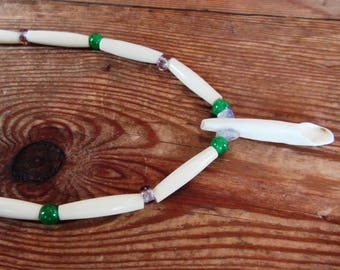 This high quality necklace's center piece is a real Coyote Tooth. 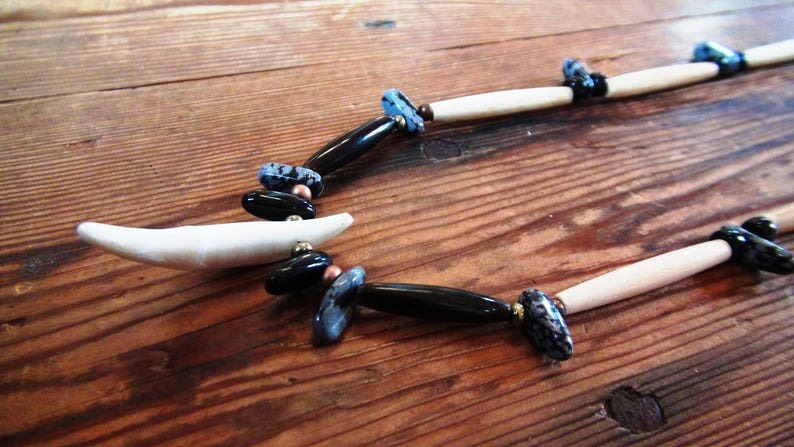 At 20 inches in length the necklace contains off-white bone pipe beads, black glass beads, copper beads, brass beads, blue cats eye beads and lots of snowflake obsidian. It's double strung on professional grade bead wire and fastens with a pewter toggle clasp. 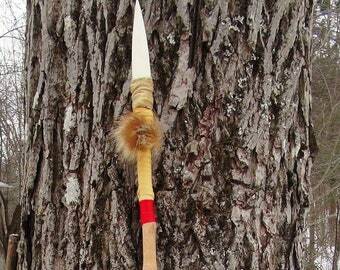 This is a stark streamlined tooth that catches and projects the trickster and humorous uplifting ways of the Coyote! The tooth is slightly over 1.5 inches long with a nice snow white color. All my claw and tooth necklaces are high quality pieces of jewelry using equally high quality materials. Using items such as bone, horn, metals, semi precious stones, wood, glass and real animal teeth or claws as well as museum grade replica claws or teeth, these necklaces really stand out to any viewer. Unique, stylish, powerful and real, the energy of these necklaces can not only be felt strongly by those who wear them but by those admiring them as well. In a world where plastic and other cheap materials are fast replacing authentic, natural and powerfully energy emitting products, I enjoy creating necklaces that really stand out and make a statement about the natural world. In olden days people knew very well the potency, energy and "medicine" of working with and wearing natural items from the earth and all the "kingdoms" that make this planet what it is; animal, plant, mineral, etc. We are all made up of each of the kingdoms because to be alive means to consume, absorb and be a fully integrated part of them all. Wearing pieces of them can help to remind us and amplify these natural energies within us, perhaps even helping people to reconnect with the natural ways fast being lost to the modern techno world. All my replica claw necklaces are made with natural materials to help the wearer align and connect with the animal's energy. All my real claw and tooth necklaces are made from real teeth or claws that were legally acquired; legal hunting, farm/ranching (by-products of the food industry or from old animal rugs that have been salvaged. Any necklaces requiring legal certificates will be mailed with them. Most of my necklaces are strung with two strands of professional beading wire. A few of my older ones are strung on a heavy weave cotton cord. Each necklace description will state which material as used to string it. Please do not expose necklaces to chemicals such as chlorine or salt (do not swim with them). Do not shower with them, Do not sleep with them on. DO NOT COAT ANY OF THE CLAWS OR TEETH WITH NAIL POLISH - it will ruin them in time. Take good care of them and they will lat you a good long while of extensive wear.